More than 200 pushchairs for children placed near Century Park entrances have been cleared by authorities for unlawfully occupying the sidewalks. More than 200 pushchairs have been cleared by authorities for occupying sidewalks by one of the city's parks. The 262 child strollers appeared at the weekend near several gates of Century Park on Huamu Road, Jinxiu Road and Fangdian Road. The operator of the pushchairs, used for children aged between 2 and 7, is DeeMeng, which is based in Shanghai. It said it had provided a convenience service for parents with young children. Like shared bikes, the pushchairs require users to register and scan a code. There were about 1,000 people registering over the weekend, DeeMeng said. Users pay a 99-yuan (US$14.75) deposit and are charged 1 yuan for every 30 minutes of use. Public sanitation and environment management authorities in Huamu area said officials spotted the pushchairs occupying sidewalks in the Century Park area during patrols on Saturday. Some of the pushchairs were blocking areas reserved for blind people, officials said. 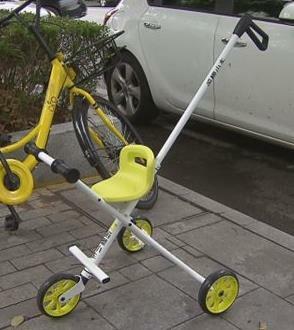 On Friday, the city’s transportation commission ordered bike sharing companies in Shanghai to stop launching new shared bikes until further notice, but DeeMeng said its pushchairs are not shared bikes and it is in talks with officials to launch more pushchairs.